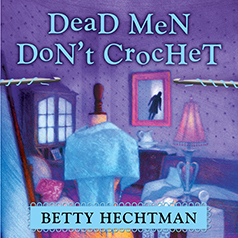 When a member of Molly Pink's crochet group is suspected of murder, it's up to Molly and her pals to pick up the dropped stitches and catch a killer. The Tarzana Hookers are a motley crew of women, all of whom are not afraid to speak their minds. Except Sheila, a timid, anxiety-ridden crocheter in desperate need of money, who sells her beautiful scarves at a local consignment store. When the owner stiffs Sheila, the boisterous ladies rally to her support. Then the shop owner is found dead. Molly Pink ignores the warnings from her homicide-detective boyfriend and sets out with her stitch mates to clear Sheila's name. "I have enjoyed Margaret Strom’s narration before and she does good with this series." ---Books, Movies, Reviews! Oh My!